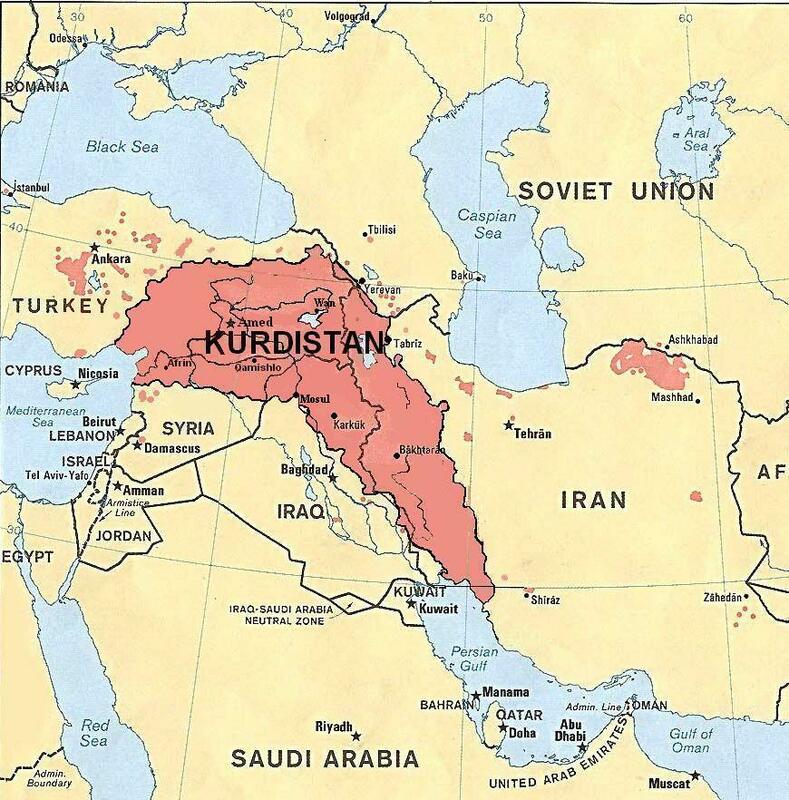 Kurdistan -- an area spanning six countries: Iraq, Iran, Syria, Turkey, Armenia and Russia. 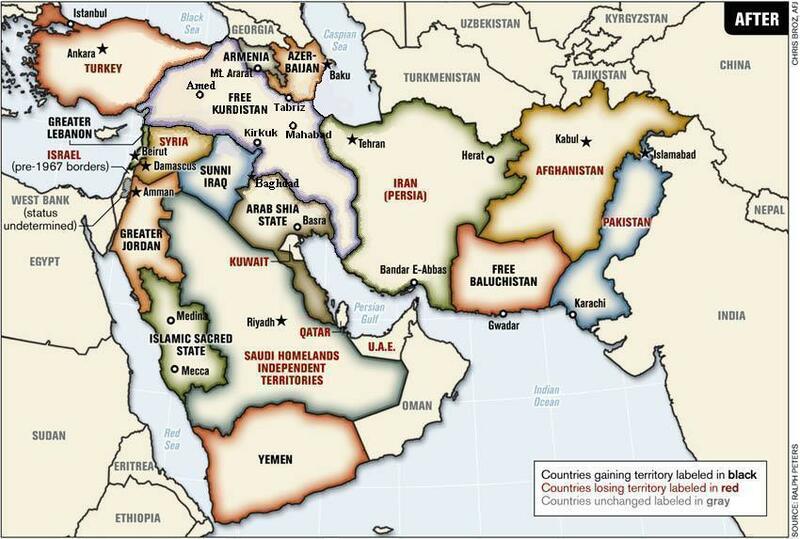 Kurdistan lays just to the north of the fantasy called "Greater Israel." 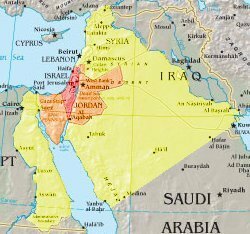 I guess it's no coincidence that Israel's enemies are the same countries destined to be broken up when the Middle East gets redrawn. Voltairenet (via Arthur Zbygniew) has put up an extensively footnoted article by Thierry Meyssan about the geopolitical strategic decisions behind the Gaza Flotilla events. 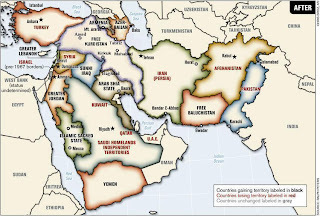 It appears that Israel saw another option, the possibility to destabilize Turkey. The Israeli government believed it had another option: to show to the Turkish Army Chiefs of Staff that if the civilian government came to the aid of the Palestinians, Tel Aviv could in turn instigate the Kurdish separatists; and prove once again that, with the backing of the United States, Israel is above international law. In short, the Netanyahu government considered it possible to pressure the Turkish military to organise a fifth coup d’état. With this in mind, the Netanyahu-Barak duo sponsored Kurdish mercenaries to launch a terrorist attack against the naval military base of Iskenderun in southern Turkey. It was carried out on 31 May shortly after midnight. Rockets were fired during the changing of the guard, killing 7 soldiers . Links are being established between the flotilla raid and the PKK militants who attacked the military base. ANKARA, Turkey, June 7 (UPI) -- There is a possible connection between the Israeli raid on a Turkish-flagged vessel and Kurdish militants, Turkish intelligence officials speculate. Militants with the outlawed Kurdistan Workers' Party, or PKK, stormed a Turkish naval base May 31 in the port city of Iskenderun, killing six Turkish soldiers in the attack. On the same day, nine Turkish nationals were killed when Israeli forces raided a vessel said to be delivering humanitarian aid to Gaza. Sedat Laciner, a director at Ankara's International Strategic Research Organization, told the Turkish daily newspaper Today's Zaman that the two episodes may be connected. He said there is growing speculation that Israeli intelligence officials have worked with the Party for Free Life in Kurdistan, or PJAK. PJAK is affiliated with the blacklisted PKK. According to the director of a Turkish think tank, Mossad operatives provide training to PKK militants in Northern Iraq. The head of the International Strategic Research Organization, Sedat Laciner, said the Israeli Spy Agency's (Mossad) operatives and the Israeli military's retirees had been sighted providing training to PKK militants in Iraq's Kurdistan. Laciner said Tel Aviv does not have a positive perception of Turkey's ruling Justice and Development Party — led by Prime Minister Recep Tayyip Erdogan — and thus tries to paint a radical picture of it. "The PKK is a mere contractor for Israel to serve that purpose," he explained. Laciner said some Israeli groups work with PKK, using its offshoot, Party for Free Life in Kurdistan (PJAK). The latter terrorist group has carried out several deadly attacks against Iranian nationals and security forces inside Iran. More than 40,000 people have lost their lives since the militant group launched its armed campaign against Ankara in 1984, as part of a quest to establish an independent Kurdish state in southeastern Turkey. Other reports say that the Turkish military has run missions over these camps. The Turkish military launched air strikes against bases of the terrorist Kurdistan Workers’ Party (PKK) in northern Iraq yesterday, Turkish media have said in reports not immediately verifiable with the army. According to the reports, the army launched an aerial attack on Tuesday using six warplanes on the Hakurk terrorist camp in Sidekan. If the reports are true, it would be the second such operation by the Turkish military in less than three weeks. A local government official in Sidekan, Ahmed Sur, disputed the claims, saying Turkish planes were seen in Iraqi airspace but that no shelling occurred. Representatives of the outlawed PKK also said there was no shelling. The raid three weeks ago also involved Iranian forces. The PJAK, Party of Free Life of Kurdistan, is the Iranian offshoot of the PKK. Turkey and Iran have in recent years shared intelligence and coordinated attacks on these two groups. The PKK is listed as a terrorist organization by the UN, NATO, the US, the EU, Turkey, and other countries (see list). Israel is not on the list. In February 2008, Turkey thanked Israel for the help against the PKK. Gonul said that Turkey used Israeli-manufactured unmanned aircraft in its south-east and cross-border operations against the outlawed Kurdistan Workers' Party (PKK), which he said have been very helpful. "We thank Israel for its support to Turkey in the defense industry. We thank Mr. Barak for sending equipment and devices that Turkey use in the south-east and in cross border operations," Gonul stressed. But Israel has also been training the PKK? Looks like it. According to Victor Ostrovsky, former Mossad case officer, Mossad has worked with the Kurds going back decades. So it probably shouldn't come as a big surprise. Thus when Abdullah Ocalan formed the PKK and allied himself with the Hezbollah and Syria in a struggle against Turkey, he acquired the Mossad as both a friend and an enemy. For some time it was Mossad that, despite Israel’s warm relations with Turkey, tipped off the PKK leader about Turkish attempts to capture him. This kept him free to harass Israel’s Turkish “friend,” and drive it to seek even closer ties with the Jewish state. At the same time Mossad, assisted by unit 8200 (Israel’s equivalent of America’s code-breaking National Security Agency), continued tracking Ocalan and his followers in their various Syrian and Iraqi hideouts for many years. Can Kurds confront PKK's Ergenekon? I have a lot of time for the cause of the Kurdish people. 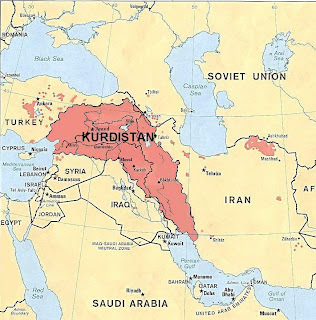 When the British divided this region – seemingly willy nilly – the Kurds were royally shafted. Was that for a long term reason? Most people are not aware how much an individual Turk takes these insults seriously. There have been 2 separate acts of war – one at sea and one on land. It does not matter if proxies were used the parties involved know where they stand. PS great link from Voltairenet. Victor Ostrovsky is right. The israelis have been grooming and supplying the Kurds with arms for many decades, as has the US. The Kurds have been promised their own country and have also been betrayed by them over it, too. israel doesn't have allies, only patsies. They (and the rest of the world) never learn, it seems. It is all to do with oil and pipelines as the proposed map of Kurdistan at the head of your article, AP, shows. "Can Kurds confront PKK’s Ergenekon?
. . . . . Can it be that the similarities between the Turkish deep state and the PKK go beyond these “incidental” similarities? Can we even talk about the likelihood of a sort of cooperation or close contact between these two? Can it be that the symbiotic relationship between the Turkish deep state and the PKK goes beyond that famed political mutual dependence that needs constant crisis or enemy for survival?" The simple answer is that both of these parties are paid off by and therefore manipulated by israel. israel simply doing what it does best; causing everybody else to fight amongst themselves for the benefit of "Greater Israel". And none of the combatants ever realizing what is happening, it seems. chuck, yes. it seems that the kurds have been screwed multiple times, promises broken, etc. similar to the balochs. and of course this builds tension over years and then here we are, and these people are ripe for justice, and who can blame them. but then some of them go and see about making deals with the same people who have screwed them multiple times before. and it's just never going to work out that way unfortunately. to your point james, they are always getting used. Not forgetting of course that Soviet assistance to pretty much everyone during the cold war was always enough to start a war but never enough to win one. And that Turkish bloke wants to thank his Israeli friends for their 'help'. Ha ha ha. On the topic, as far as I'm concerned Putin's acid test will come when he actually delivers these much-talked-about air defence missiles to Iran. Honestly, how long have these missiles been on their way? A couple of years? What's taking so long? If Iran gets destroyed, with the missiles as yet undelivered, then we'll know whose side Putin is truly on. Between 1972 and 1975, the US and Iran secretly gave Iraqi Kurds $ 16 million and large quantities of weapons to conduct an armed struggle for an autonomous state. However, the Machiavellian twist in the US and Iranian strategy was that neither country wanted to see their protégés succeed. Instead of an all out victory for the Kurds or a total collapse of the Iraqi government, the sponsors simply wanted the hostilities to continue so as to achieve their own strategic goals. According to the Pike committee that conducted the investigation, the principals “hoped that our clients would not prevail. They preferred instead that the insurgents simply continue a level of hostilities sufficient to sap the resources of our ally’s (Iran’s) neighbouring country. The policy was not imparted to our clients who were simply encouraged to keep on fighting.” The military aid that Iran provided the Kurds was precisely rationed out to deny the Kurds the freedom of action that might lead to victory. At least on one occasion, the US officials directly intervened to scupper a promising Kurd offensive that looked like it might succeed. In spite of such hindrances, some 45,000 Kurdish rebels, with help from the Iranian military, were able to keep 80 percent of Iraq’s military occupied in a fruitless struggle that drained the country’s resources. The final tangible objective of the entire exercise was to bring Iraq to the negotiating table and extract a more favourable border deal out of Baghdad. The Sadabad Pact of 1937 had given Iraq a controlling position on the Shatt Al-Arab River. Additionally, the US hoped to demonstrate to other oil-rich countries in the region that being a Soviet client, like Iraq, was an unprofitable endeavour. Putting a damper on Iraq’s anti-Israeli rhetoric was yet another minor goal. The Kurds had no idea that they were being used as pawns in a larger scheme and that they would be abandoned as soon as their sponsor’s objectives were achieved. The Algiers Agreement was signed in March 1975, dividing the waterway in a more equitable manner and within eight hours all aid to the Kurds was cut off. The Iranian border was closed and the Kurds were bluntly told to come to a settlement with the Iraqi government on whatever terms they could get from the regime. Besides the casualties of war, the US and Iranian betrayal created 200,000 refugees to whom the US administration brazenly refused to extend even humanitarian aid. In retribution, the Iraqi government forced 250,000 Kurds to move to central and southern Iraq while many Arabs were moved to Kurdish areas to pacify the region. The Pike report was never released officially. The evidence it contained was so damning that the House of Representatives voted not to release the document. It was only through the efforts of a CBS correspondent, Daniel Schorr, that the contents of the report became public knowledge on February 16, 1976. Schorr was fired from CBS for his pluck. Flames in the oil-gas video of BP? WTF? Is this for real? It's also now obvious that there were nasty problems ("out-of-control") according to leaked e-mails 6 WEEKS before the explosion. Plus lots of sell-offs of stocks, incl. Hayward (paid off his mansion). Sorry if this is old news...but this sure brings into focus a picture even darker than I ever imagined. Rapture freaks are beside themselves. bho, yeah i saw the flames, pretty creepy. do you have a link for the leaked emails? i haven't seen that yet. thx. I’m not sure who sent the link on the PKK’s Ergenekon (and the wave – cheers and back to you also) but thanks nonetheless. Interesting piece but illustrative - what we fight we become. Noor over at Snippets and Snappets has posted various pieces on the control of the Sabbateans in (Turkish) politics. I feel that their role in the “Turkish deep state” is possibly pivotal. What better revenge on the Byzantine Empire and it’s past neutering of the influence of the chosen ones? In brutal military logic Turkey sits over the main land trans-shipment route into and out of Europe. The control of this logistical asset has been fought over since Noah was a wee lad. Is that the bid on the table? Anybody know anyone who could check on Les in Europe? He's in big trouble. It's serious and I have no way to contact him. See last 2 comments on SM - says 'anonymous' but they are from Les. hey bho, i'm not in touch with him but i know someone who might be. i'll send him a note and will leave word here if i learn anything. I have just read this over on suraci’s place. It looks like the Israeli footage is faked using a sister ship of the Mavi Marmara. This is the original article that suraci mentions and they have a picture sequence that will knock you out of your socks. chuck! move to the front of the line!! holy crap batman. Double good news A.P. LV just posted – it seems he knows something also. well allrighty then, these are excellent developments. i just posted the links you sent and tweaked it a bit, and i'll go check out les. awesome find. verifying, you send me a message via yt?